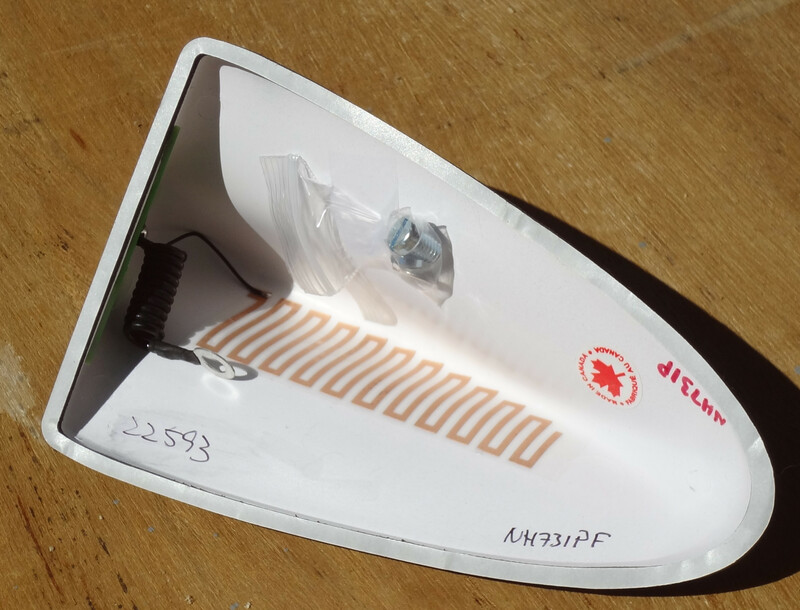 In case you're wondering what's inside the Visual Garage shark fin antenna, here's a picture. The plastic bag contains two screws. The Fit uses the thinner one. The coiled black wire to the left attaches to the Fit antenna base with that silver screw. You can see the gold antenna attached to the inside. Remove the paper covering around the edge, and you find sticky foam for attaching it to the roof. The directions give details about how to install it by marking the position with masking tape. I just eyeballed it, and it turned out fine. This one is black on the outside. The purpose of the antenna is to receive radio signals. Does the Shark fin perform Better / Worse than the stock antenna? After having the shark antenna for a few weeks now, I noticed in some instances under a bridge or at a certain point under a street lamp, stop light, etc... My radio would have more static than with the oem antenna. Enough that my passengers would notice too. Only certain instances but since my commute route is the same, it only happens when I'm at those same locations so there's certainly some interference that wasn't there with stock antenna. However, its minor issue to me since I listen to Pandora or iPod more than my radio. noripwr- thanks for the photo of the inside-- I already installed mine and had forgotten how it looked. I have not noticed a difference in reception--I used to get some static/interference on the original antenna when driving by the local university and other places that use a lot of electrical equipment before-- On the open road, reception seems about the same--but will need to pay closer attention in other situations. I believe that most factory shark-fin antennas come with a pre-amplifier. It's pretty difficult for that little zig-zag of an antenna to catch much signal, particularly in close proximity to the sheet metal. It should work fine if there is a strong signal, but in the fringe you might be wishing for the stock stick or better, like a full 1/4 wave whip. I didn't put up the picture BTW, that thanks goes to silverex. But yea, your mileage may vary. Some people get better, some the same, and some worse reception. I can't see (hear) any difference.